—So what about the women murdered for the grave crime of being women? Will the fact that they have demanded that the attacks stop and, with their blood, raised the topic not just to the national agenda but the global one, make them the object of mockery, disdain, and accusations that they are playing to the right? Because they aren’t dying, they are being killed. What if they refuse to accept that this is a problem that can be solved by addressing corruption? And if they dare to say that the origin of this murderous hate is located in the system itself? What if they come up with the crazy idea to side-line men with regard to the most vital decisions (yes, as in questions of life of death)? And if they decide to take their destiny into their own hands? Would any part of that, or all of it, be a governmental manoeuvre to avoid… etcetera? —The parish priests, nuns, and laypeople of the progressive church see and feel first-hand, without intermediaries, the pain, angst, and desperation of migrants, the families of the disappeared, and entire peoples under attack, as well as the rage concerning impunity and the frustration of suffering injustice which has been made law with pomp and circumstance. Are they trying to use this pain to their own benefit? What would they gain by making those cries theirs, by identifying themselves with that rage? And if from that perspective, formed not just in the face of threats of all kinds but at the risk of their own earthly lives, they claim openly and reflectively that the solutions offered on the horizon are not sufficient, are they thus opposed—being who they are and accountable to what they are—to a real change? —If the mere possibility of an indigenous woman existing as a citizen (with all of its rights and obligations) has the effect of causing “the earth to tremble at its core,” what would happen if her ear and her word travelled through all of Mexico below? —You who are reading this: would you be bothered by watching and listening to a debate between the Calderona [i] from above, with her “traditional” luxury brand clothing, and a woman below, of indigenous blood, culture, language, and history? Would you be more interested in hearing what the Calderona promises or what the indigenous woman proposes? Wouldn’t you want to see this clash of two worlds? Imagine, on the one side, a woman from above, born and raised with every luxury, educated to feel superior in race and colour, complicit and promised heiress of a psychopathic enthusiast of alcohol and blood,[ii] representative of an elite that is steering the Nation toward total destruction, and chosen by the Ruler to be his spokesperson. Imagine on the other hand a woman who, like many, made her way working and struggling every day, every hour, and everywhere, not only against a system that oppresses her as indigenous, as poor, and as a worker, but also as a woman who has faced a system reproduced in the image and likeness of the brains of men, and not just a few women. Wouldn’t she, with everything against her, today, without yet knowing it, have to now aspire to represent not only herself, her collective, or her originary people, tribe, nation, or barrio, but also millions of women who are distinct in their language, colour, and race but equal in their pain and rage? Would this not be a situation in which on one side would appear a white criolla woman, the symbol of oppression, mockery, scorn, impunity, and shamelessness, and on the other a woman who would have to lift her indigenous spirit above the racism that permeates every level of social strata? Isn’t it true that, almost without knowing it, you would cease to be a spectator and desire, from the deepest part of you, that the victor of this debate, after a good battle, would be the one who had everything against her? Would you not applaud that, in the name of this indigenous woman, it was truth that won and not the power of money? Already at the door, the little girl turned around and said: “Hey Sup, if my mom comes and asks if you saw me, you just tell her clearly that Chicharito doesn’t play for Barcelona and Messi doesn’t play for the Jaguars. I mean don’t tell lies, because mothers always know when you’re lying. So what you have to do is change the game, pretend you’re headed one way, but really you’re going in another. I can explain that to you later, but study first, because if you are going to go to the autonomous school they are going to make fun of you, and Pedrito will be the worst, because the little jerk is bragging that he finished grade school. But he’ll see that I’m going to finish too and then get outta here, to hell with him. About the team, don’t worry, there will be more of us. Sometimes it takes a while, but there will be more of us.” The little girl left. TUXTLA GUTIÉRREZ, Chis. (apro). 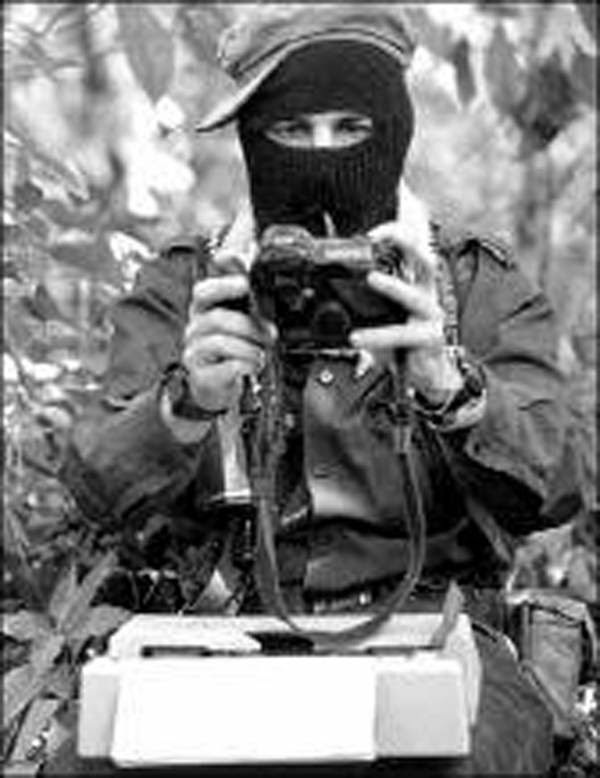 – The Zapatista National Liberation Army (EZLN) today came out in favour of the teachers’ fight against the education reform and asserted that with the repression and the closure to dialogue and negotiation, the Mexican government does not seek to apply the law, but rather to do violence to it. The government: “is not applying the law, the law is being violated. It says it is defending the constitution –the education reform–, violating the constitution -the laws that guarantee fundamental rights such as the rights of assembly, petition and free movement,” it accused. At 16 days from the start of the fight of the “teachers in resistance and rebellion,” Subcomandante Galeano and Subcomandante Moisés, spokespersons and military leaders of the EZLN announced today their position on what is happening in Chiapas and other parts of the country where battles against “the misnamed education reform” are taking place. “The misnamed ‘education reform’ is not about education, it’s about labour. If it were educational the views of the teachers and families would have been received. When the government refuses to dialogue about the reform with the teachers and families, it is recognizing that we’re not dealing with improving education, but rather with ‘adjusting the roster –that’s how capital calls the firings,” says the missive signed by both masked men.